Annecy has lots of restaurants, especially in the Vieille Ville. 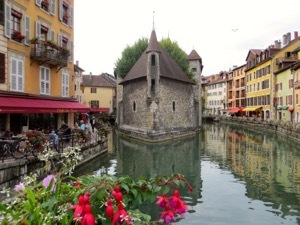 Annecy attracts a lot of tourists, and as such it has a lot of restaurants. You'll find a great variety of restaurants in the Vieille Ville, or old part of town, lining the canals. Many will offer local specialties, such as fondue or raclette, as well as fish from the Lac d'Annecy. Be sure to try some local fish; the varieties tend to be mild whitefish, simply prepared and delicious. Other local specialties include tartiflette, a mixture of potatoes, reblochon cheese, bacon, and onions. It's delicious, but don't tell your cardiologist. There are also a number of cafés and restaurants along the pedestrian Rue Royale, on the outskirts of the Vieille Ville. Since every region seems now to have its own variation on a kir, be sure to try a kir savoyard, a combination of crème de mûres (blackberries) and pétillant de Savoie (local sparkling wine). It's tasty and always fun to try the local specialty. The Savoy region also produces some very nice wines. They are not as well known as the bigger regions (Bordeaux, Burgundy, etc.). Ask the restaurant to recommend some local ones to try. Above, Restaurants line either side of the canal near the Palais de l'Ile.